The curriculum is designed to allow students to freely use English, a commonly used language throughout the world, as a tool of communication. By graduation, students are expected to reach English levels that are equivalent to at least 550 points on the TOEFL exam (80 points in iBT), 730 points on the TOEIC exam, and levels that allow students to communicate effectively and correctly with individuals from other countries. Three courses – the International Relations Course, the International Cultures Course, and the Linguistics Course – have been designed to meet the individual interests and needs of students. The courses do not only allow students to learn English, but also guide them in attaining knowledge and developing an understanding of specific global fields. Courses are offered in English, Spanish, and fourteen other languages to encourage students to learn in different languages. Through studying in different languages and developing a broad range of perspectives and viewpoints, students become capable of gaining a better understanding of the world, and are able to use more than just their English skills in their careers after graduation. Kansai Gaidai University boasts a network of affiliations with 387 universities in 55 countries , and provides students with a great selection when it comes to choosing fields in which they would like to pursue. Approximately 2,000 students are sent abroad each year on a variety of programs, through which they are able to refine their language skills and develop firsthand experience in other countries. The goal is to assist students in attaining specific and expert knowledge about international relations, and also in developing an understanding of the balance between nations in terms of their relations so that students may have the potential to excel in any country in the world. The International Relations Course aims to provide a global perspective through which students can view societies, and also lead students in theoretically analyzing and understanding the different parts of the world. In addition, fundamental knowledge that is required for working in international corporations and institutions are also covered in this course. Subjects of business, world history, and mathematics are also featured. The International Relations Course provides education in social sciences as well as international understanding, and is perfect for students who are interested in pursuing an international career. The purpose of this course is to allow students to be capable of transitioning from studies in specific areas and regions towards looking at the world general, so that they may develop a global perspective and an open point of view. Classes in the International Cultures Course are designed for those who are interested in using English and Spanish in their future, and provide education relevant to the culture and social composition of English and Spanish speaking areas. The course is also suitable for students who wish to participate in long-term study abroad programs, as there are a variety of courses available that are taught completely in English. Students who are interested in pursuing a multicultural and multilingual career or a future with international corporations and institutions are encouraged to select this course. The Linguistics Course serves as a means through which students can become professionals capable of utilizing their strong language skills and developing expertise in language and literature studies. Language classes cover the elements of reading, writing, listening, and speaking in both English and Spanish, and also probe deeper into each language by studying its literature and usage. In order to allow students to be able to use English and Spanish professionally in business, communication techniques and also the composition of each language are subjects that are taught in this course. The Linguistics Course is an excellent path for those who wish to become interpreters, translators, English teachers, Japanese teachers, Spanish teachers, and professionals who use English and Spanish to their advantage. Mandatory English Language Classes covering the elements of reading, writing, listening, and speaking are taught in small classes with fewer than 25 students. Classes are arranged based on the English levels of each student in order to maximize learning for all students in each class. Mandatory Core Classes take on a content-based approach and introduce a variety of subjects – including current events, environmental issues, history, religion, and literature – so that students can learn to use English in different methods and situations. Articles, newsprint, audio, video, and other forms of media are also incorporated into the classes. Students are expected to learn the fundamentals of English during first year, and then put their skill into practice in second year, so that they will have a firm grasp of the English language within two years. Three specialized courses – the International Relation Course, the International Cultures Course, and the Linguistics Course – are available. Students temporarily enroll in a specialized course, and after the end of their first year, they select which specialized course they would like to take based on their career paths and goals for the future. Students then spend the remainder of their years studying in the course and field that they have chosen. Although there are classes that have been created specifically for each course, in order to allow students to become better educated and well-rounded, it is possible for students to take classes designated for courses other than their own. Students spend their fourth and final year under the supervision of their instructors on high level research projects that are directly related to their course. The College of Foreign Studies does not only provide education in language studies and linguistics. General and Liberal Arts Classes are made available across all courses, and allow students to attain knowledge in terms of culture, mannerisms, and other aspects of modern society, and also in specific fields such as philosophy, psychology, politics, mathematics, environmental studies, athletic and health studies, in addition to others. Through General and Liberal Arts Classes, students may also have the chance to earn credits for participating in internships and volunteer programs that positively contribute to society with corporations, government institutions, and other organizations. A total of 124 credits are required for graduation. Within the 124 credits, students should have 24 credits from Mandatory Core Classes and at least 60 credits from Course Specific Classes. The remaining 40 credits can be from classes designated in courses other than the one that the student has chosen, or General and Liberal Arts Classes. The minimum credit requirement for graduation is 124 units. Students must earn at least 24 credits in core subjects and a minimum of 60 credits in Course subjects provided for the student's Course. The remaining 40 credits should be acquired by completing courses selected from Course subjects (including those of other Courses) and common subjects. The Super IES Program is an innovative educational program to prepare students both in English language proficiency and academic content to be successful in their studies in undergraduate programs abroad. The Super IES Program includes four segmented programs; three of which have been developed in collaboration with our overseas partner institutions, and the remaining one on our own. By studying in proficiency-dependent small classes, students develop sufficient skills to be able to successfully carry out undergraduate courses conducted in English. A content-based approach is used to complement academic content in their study areas while enhancing academic English. Students are expected to study abroad during their 2nd or 3rd year. 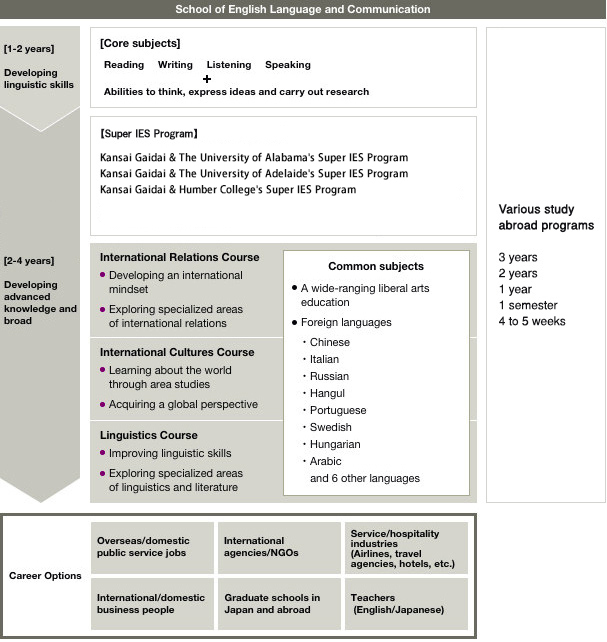 Kansai Gaidai’s study abroad includes two-year degree-seeking programs, two-year two-country programs, and one year undergraduate studies programs, all of which will provide our students with opportunities to pursue their studies in undergraduate programs.